This boneless skinless chicken breast recipe is easy to make on your Foreman Grill and is bursting with flavor. For best results, prepare the chicken a few hours in advance or overnight to enhance flavor. The robust flavor of the garlic with the subtle flavor of the rosemary, oregano and thyme make for a wonderfully flavored, healthy, and low fat meal. It’s also delicious the next day cut up and served over salad with your favorite dressing. Combine all ingredients, except chicken, in a bowl and mix well. Pound chicken will a meat mallet until 1/4″ to 1/2″ thick. Place chicken in a baking dish with the marinade, cover and place in refrigerator for at least 30 minutes (the longer the better – overnight if you can). Preheat grill with lid closed for at least 5 minutes (use high heat setting if your grill has temp controls). 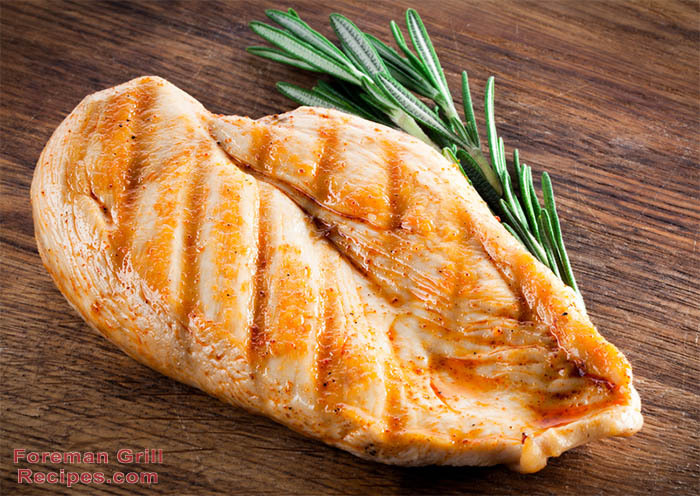 Place marinated chicken breasts in your Foreman Grill and grill for approximately 3-5 minutes. Make sure chicken is cooked through (NO pink in the middle).